Creating a welcoming space takes a combination of style and tidiness. Being organized is important because clutter has a way of spoiling decor and making a room feel drab. But, contrary to what home stores say, you don't need a lot of money to get your house in order. You can add style to your home and keep it organized while saving yourself some hard earned cash. The most important thing to remember is not everything needs to be used for its intended purpose. These home organization hacks will help you think outside the box the next time you have a pile of household items to sort through. Tank tops have a tendency to pile up in any drawer or closet since they are an inexpensive staple to most wardrobes. Want to keep them in order? All you need is one clothes hanger and a package of shower rings that you can pick up at the Dollar Tree. Adhere rings to the hanger and drop the tank top straps into the shower ring before shutting. Don't limit yourself to just tank tops; This shower ring hack can also be used to organize scarfs, ties, necklaces, belts, and hats. Recreating tin cans into something new is not a new concept, but it is a hack that has endless possibilities. Depending on your decor aesthetic, you can either decoupage, paint, embellish or leave the tin cans in their current state. 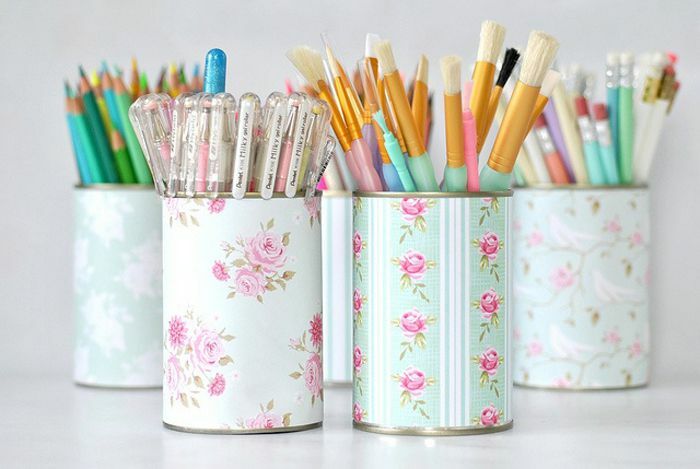 We like using tin cans as pencil and pen holders in the office, but that's just the beginning. Organize makeup brushes, toothbrushes, art brushes or utensils. Need extra organization in the basement? Use tin cans for nails, screws and small accessories. The more technology we introduce into our home, the more cords we have to keep straight. While some things are wireless, most electronics connected to your TV are not. If you've ever had to go behind your entertainment console, you'll know how easy it is to be stumped as to which cord is which. Organize them for good using old bread tags. This home organization hack also works well behind your computer in the office. Need other ways to keep your cords straight? Clip some binder clips to the edge of a table to prevent chargers from falling to the ground: instant and inexpensive charging station. Necklaces need to be organized in a hanging fashion so you can avoid stubborn knots and tangles. But there's no need to go out and buy an expensive jewelry organizer. Consider repurposing something you already have, like an antique rake in your garage. Antique rakes have been used for a lot of organizing missions. Consider hanging cooking utensils, garden tools or paint brushes. These file folders from the container store were made for just that purpose–storing files. But if you're anything like most homeowners, you have a plethora of extra grocery bags laying around. Adhere these or any file folder to the inside of a pantry or cabinet door. File folders and magazine holders are constantly being utilized for new organizing hacks. Store produce, water bottles, canned food, tin foil–just about anything kitchen related can be stored in these inexpensive folders. If you're lucky enough to have a cleaning closet, you should take the time to make sure that it too is cleaned and organized. Cleaning products have a way of cluttering up any space, so this over-the-door shoe organizer does an excellent job of keeping them organized and easily accessible. Also, take a hanging shoe organizer and use that to store paper towels as you see here. If your cleaning closet doubles as a linen closet, use the hanging shoe organizer for extra bathroom towels and linens. This home organization hack will get you in the DIY spirit. So many people are recreating antique dressers by removing drawers and adding baskets in their place. Take that old drawer and turn it into something new. Some paint, castors and a little TLC will transform an old drawer into a clever under the bed storage compartment. Use it in a kid's bedroom for toys, in a guest bedroom for extra blankets or in the small master bedroom for excess clothing and shoes. When looking to invent a new home hack, one must consider all possible uses of an object. Whoever decided to reinvent a wine rack as a towel rack is a genius! The best part? This hack provides much-needed storage space in small bathrooms. What else could you store in a wine rake? How about rolling pins or water bottles? Remote controls are a nuisance. They either get lost in your couch cushions or your young children want to play with them constantly. Unfortunately, most remote control holders aren't very attractive. The solution? Create your own using an old hollowed out book. If you're not up for a DIY project, you can buy one already made on sites like Etsy or you can purchase a faux book like Dear Lillie did at Homegoods. In order to have an entire household organized, you can't forget about the garage and shed spaces. Old pallets have been reused in numerous ways, but this storage solution is pretty simple. Adhere an old pallet against a wall in your garage and use it to store outdoor tools. No saw needed! You can also attach portions of PVC pipe to the wall or hang and ​an old coat hanger to store shovels and rakes.